Want to know how many standard drinks are in an alcohol container? Try our drink calculator. 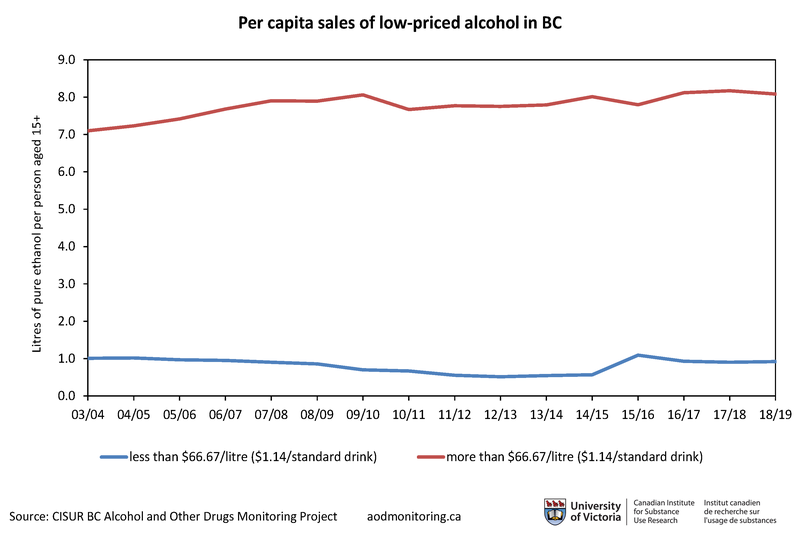 In the most recent year of our BC AOD Monitoring Project data (2017/18), BC recorded yet another yearly increase (0.01L) and highest overall amount of per capita pure alcohol (ethanol) consumption (9.44L) in the 15 years that we have been tracking this data. 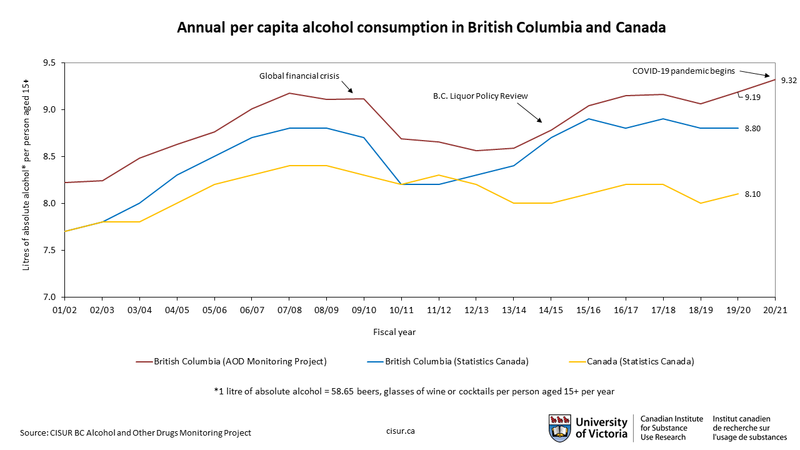 While it was a very small increase, it demonstrates that British Columbians continue to consume more alcohol than the average Canadian with a continuing upward trend. Age 15+ per capita alcohol consumption of 9.44 L equates to the average British Columbian drinker aged 15+ consuming 554 bottles of beer a year, 10.5 per week or 1.5 per day (regular strength 5% 341 mL bottles) or 105 average strength bottles of wine (12%, 750 mL bottles) or two bottles of wine per week or 1.5 medium glasses per day. The most recent Statistics Canada data for per capita pure alcohol consumption in Canada (2016/17) held steady from the previous year, for a total of 8.1L per person aged 15+ per year (or 475bottles of 5% beer each per year). Their data saw a 0.1L increase in BC from 8.9L to 9.0L, well above the Canadian average. Read more about our methodology or download our data tables. 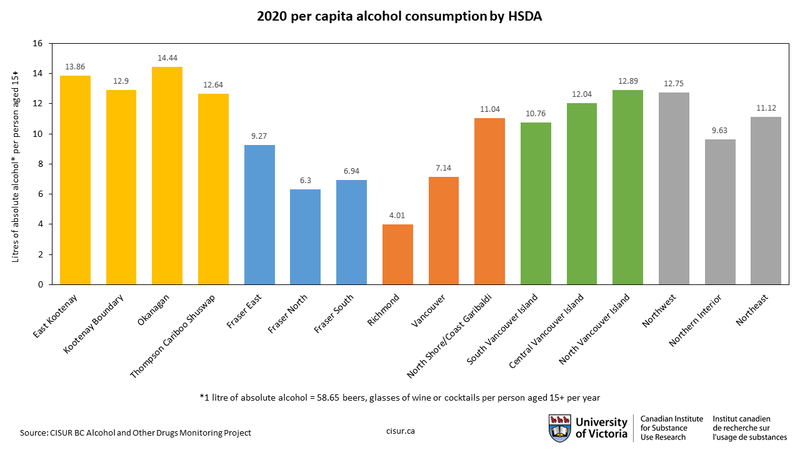 You can view interactive maps of alcohol consumption in BC (2002-2017, broken down by Health Authority, Health Service Delivery Area and Local Health Area) via our AOD Trend Analyzer Tool. In 2017, the highest alcohol consumption in BC was in the 1. Interior (13.17L), 4. Vancouver Island (11.59L) and 5. Northern (11.11L) Health Authorities, with the lowest levels in the 3. Vancouver (8.85) and 2. Fraser (6.89) Health authorities. Consumption in the Interior is almost double that in Fraser. For more detailed, interactive maps, please visit our AOD Trend Analyzer tool. The Health Service Delivery Areas with the highest alcohol consumption in 2017 were both in the Interior: 11. East Kootenay (14.23L) and 13. Okanagan (13.69L). Consumption was lowest in 22. Fraser North (6.15L) and 31. Richmond (4.34L). When broken down to Local Health Authority, highest 2017 consumption was recorded in 48. Howe Sound (26.95L), 4. Windermere (25.99L) and 14. Southern Okanagan (24.86L). Lowest was in 166. Vancouver-South (4.15L) 94. Telegraph Creek (0.13L) and 89. Nisga’a (the independent health authority reported 0L of alcohol consumption). In 2010, private liquor stores became the leading purveyor of alcohol in BC, overtaking government liquor stores, and accounting for 44% (or 17.1 million litres) of the total volume of pure alcohol sold in the provice in 2017. Our data also shows that alcohol sales from bars are going down. It is likely that the increasing sales from private liquor stores are driving some of the upward trend in alcohol consumption and maybe this increasingly competitive liquor store market is taking business away from the bars. 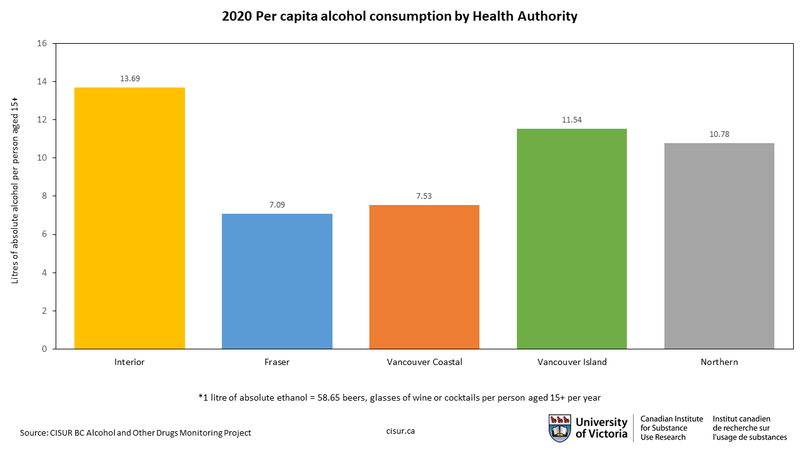 Our previous BC research shows how private liquor stores contribute to increased consumption and harm. While beer has consistently remained the most popular beverage type since 2002 (British Columbians bought the equivalent of over 895 million bottles of 5% beer in 2017, or an average of 218 bottles per year for every citizen aged 15+), wine overtook spirits in 2011 to become our second most popular beverage. In 2018, British Columbians drank the equivalent of over 121 million bottles of 12% wine, or 30 bottles per year per person aged 15+. As of 2018, there are a total of 7,646 alcohol outlets in BC, including restaurants, bars, and government and private liquor stores. From 2002 to 2018 (mean for first three months), restaurants increased by 21.1%, Private liquor stores increased by 142.9%, and government liquor stores and bars decreased by 7.3% and 13.2%, respectively. 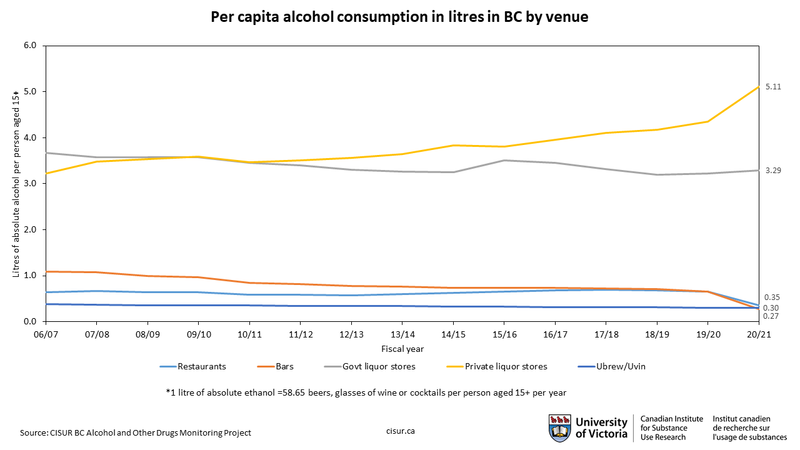 Once we use population data to look at rates of alcohol venues per 100,000 people in BC aged 15+, we see that restaurants have seen very little change from 2002-2018. Government liquor stores have fallen from 6.3 to 4.8 per 100,000 citizens aged 15+, while private liquor stores have been on the rise and bars have been steadily declining. 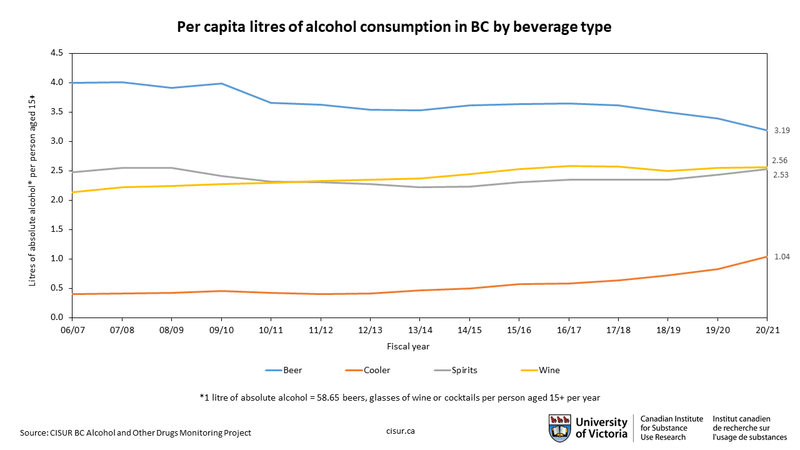 Sales of low-cost (<$66.67/litre, or less than $1.14 per standard drink) alcohol have declined overall since 2003, when they accounted for nearly 13% of all alcohol sold in the province. 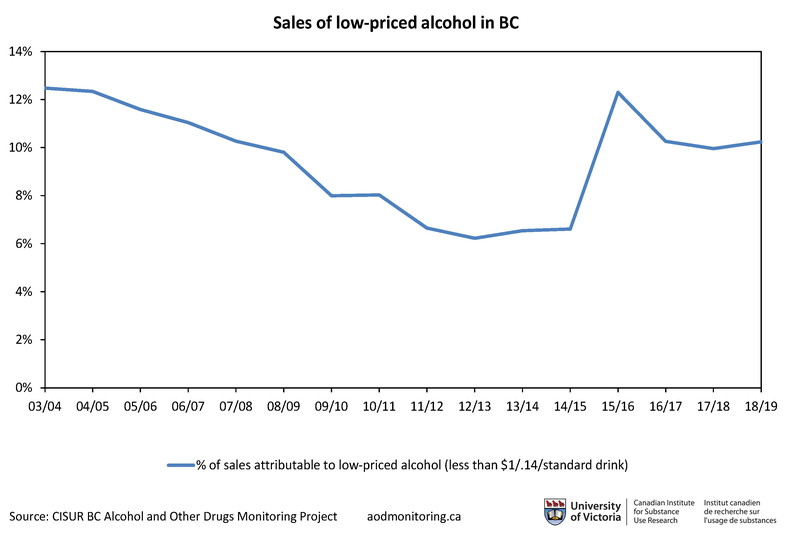 However, after hitting a low of 6.5% in 2013, they rose 4.5% between 2014 and 2015 and accounted for 10% of all alcohol sold in BC in 2017.